I’ve decided to add a new feature to my blog where I review products. This is my first! I hope you enjoy this new category that I will be adding to regularly. One thing that I absolutely love about It’s Organic (my produce delivery company) is that they are always adding new items to their inventory. 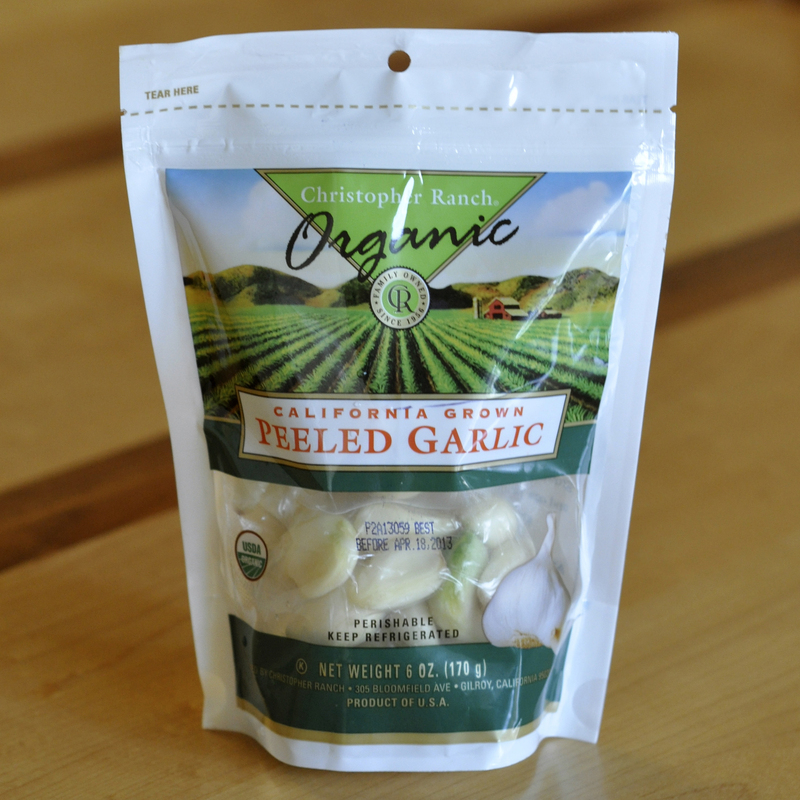 One of their newest items is organic peeled garlic cloves from Christopher Ranch. Last week they gave me a complementary 6 oz bag to try out. Awesome! Love those guys! Now I personally am a huge garlic lover. I use garlic in my cooking almost every day. It’s the Italian in me I suppose. 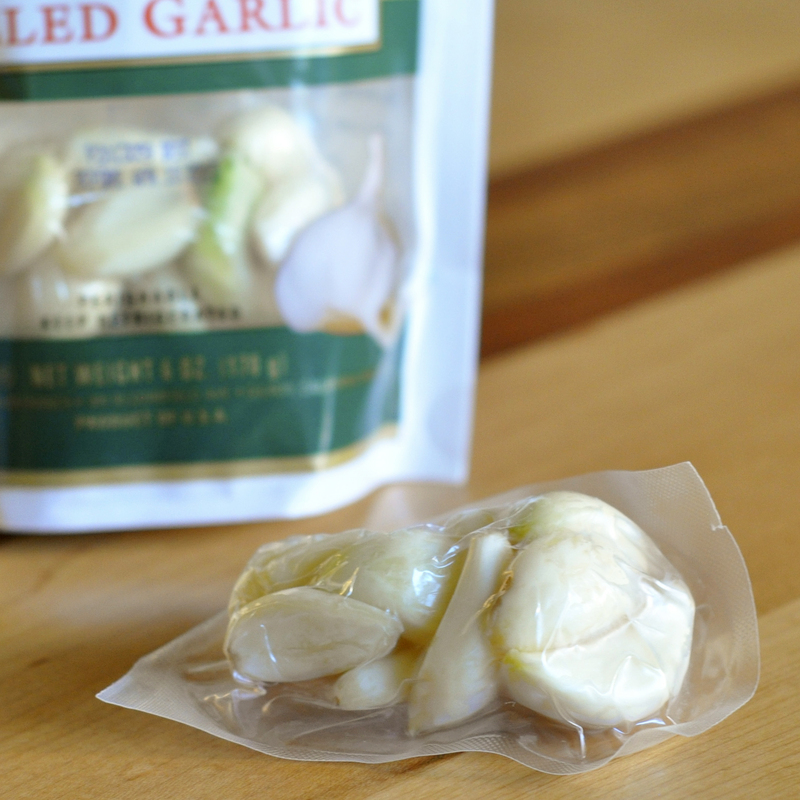 I am always looking for ways to cut down on the prep time while working in the kitchen so I love the idea of not having to peel all those pesky garlic cloves by hand. I already have a million other things I am trying to do. My only concerns with a product like this is whether or not it would go bad before I could use it all (I hate wasting stuff) and whether or not flavor would be compromised. Time to put the product to the test. Would it taste just as good as fresh garlic? I used these garlic cloves in both a Mexican dish as well as an Italian one. What better tests, right? I can promise you, no flavor was compromised in the least. Once you open the pack you can smell the strong aroma of garlic, the same aroma as you would get with fresh peeled cloves. These garlic cloves were just as tasty as ones I peeled myself. And my hands didn’t smell like garlic for the rest of the evening! The cloves were not dried out in the least. The garlic cloves still had plenty of those natural oils that give you the great flavor. Overall, I think this is an absolutely fabulous product that I most certainly will be purchasing in the future. I looked at the price online and It’s Organic! is selling this for $3.49 a bag. I think that is an awesome deal! I would guess that you get about 4–5 bulbs of garlic per package so you aren’t paying any extra. It’s USDA and CCOF Certified Organic. If you are currently a member of It’s Organic! and you like to cook with garlic, I highly recommend you add this product to your box. What do you have to loose? And if you are not a customer of It’s Organic!, see if your local store carries this wonderful product. Christopher Ranch products are available in grocery stores all across the US. If you can’t find it at your local market, see if you can request that they carry it. If your company has a product you would like reviewed please feel free to contact me at divadicucina@yahoo.com. I always love trying new products!